the grandest view in the world! 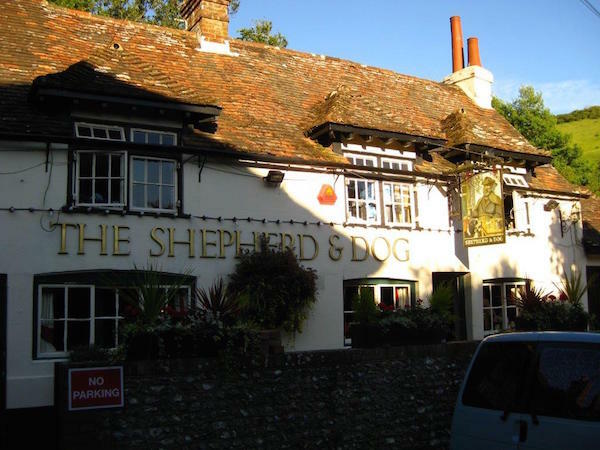 The pub dates back to the 18th century and is made up of the original ramshackle cottages with all the quirky character that entails, including low ceilings. Tall ladies and gents beware! My husband managed to brain himself despite all the carefully placed signage. Self-inflicted head injuries aside, the pub is gorgeous, cosy and homely with plenty of interesting little knick-knacks dotted about. 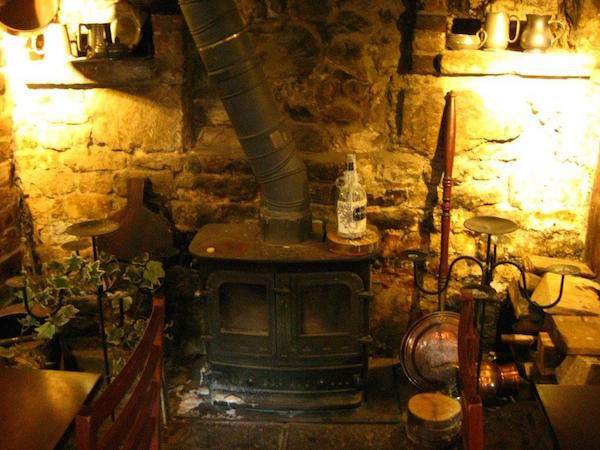 Right at the heart of the pub is a huge, very grand fireplace, inside which stands a lovely old wood burning stove surrounded by assorted trinkets. 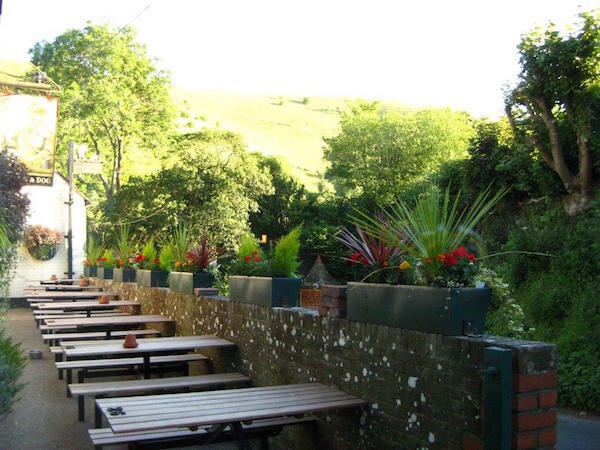 If you’d rather enjoy the sunshine and fresh air, there is plenty of outdoor seating both directly outside the pub and in the large beer garden, all with glorious views of this legendary beauty spot. 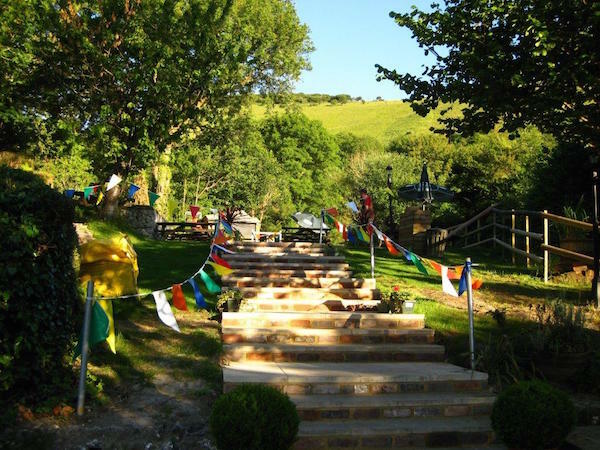 The staff pride themselves on using local Sussex produce, ensuring they use only the freshest, highest quality ingredients and supporting local businesses in the process. They offer a wide range of craft beers and hand pumped real ales as well as any other tipple that might tickle your fancy. They serve a lunch menu of tapas alongside your traditional pub fare from 12pm – 4:30pm. Dinner orders are taken between 6pm and 9pm. 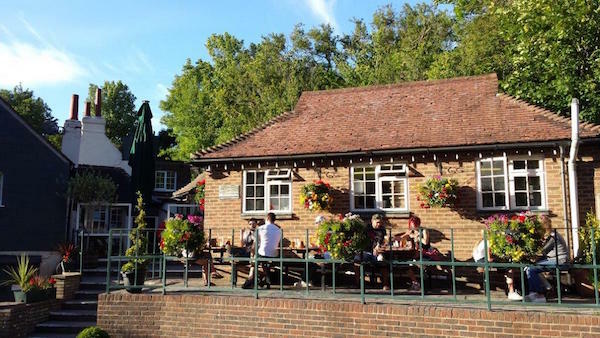 They also do Sunday roasts and offer a kids menu, as well as hosting a series of fun-sounding events, including Cider and Beer festivals and a Gin and Jazz festival. The evening we visited was gloriously warm and sunny. If we’d gone an hour earlier we would have taken the mutts and luxuriated in the garden but we still got to enjoy the fabulous views from our spot by the window. Whilst we decided what to eat, Andrew ordered a pint of Best and I went for a glass of a lovely, fruity Sauvignon Blanc. 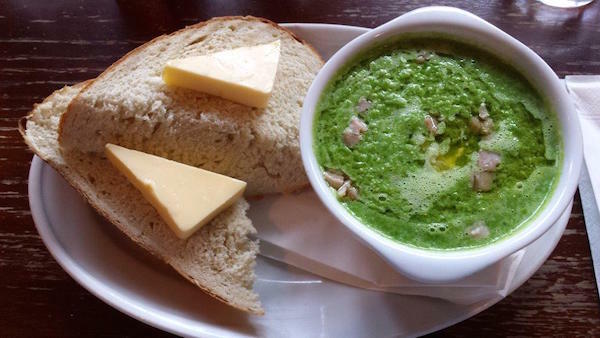 To start Andrew had the Ham & Pea Soup with Wild Garlic, Poached Egg, Truffle Oil and Home Made Bread. The soup was a stunning, fresh, vibrant green with a generous glug of earthy truffle oil glistening on the surface. It tasted sweet and rich with overtones of garlic and savoury notes from the little pieces of ham. The yolk from the poached egg added an extra velvety texture to an already thick, hearty soup. The door step slices of bread were fantastic, light as a cloud in the middle with a crisp crust and there was a good wedge of butter to go with it. 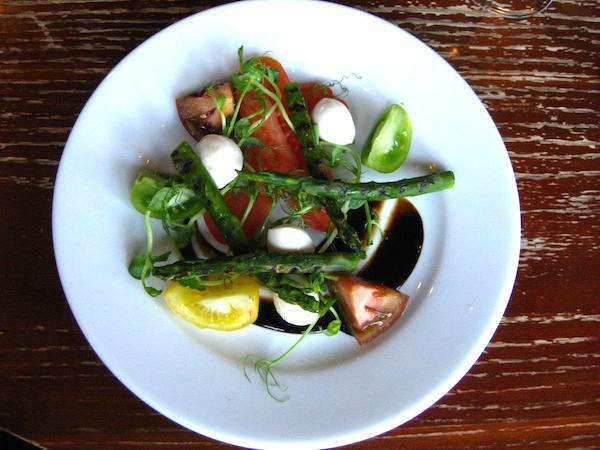 I had the Heirloom Tomato, Bocconcini and Grilled Asparagus Salad with Micro Cress and Balsamic Glaze. It was a bright, colourful, summery dish and it was delicious! A simple, classic combination that makes you slow down to savour each mouthful. 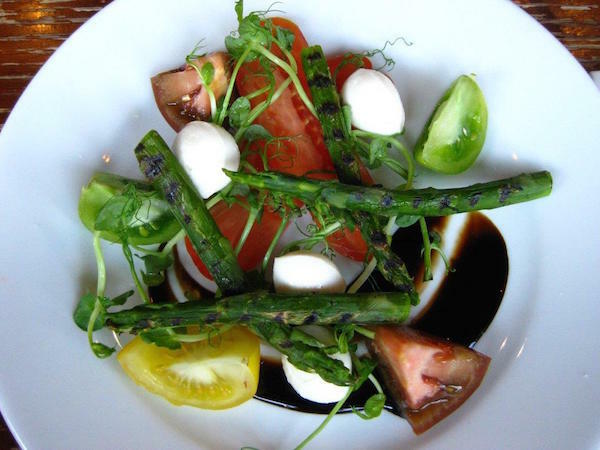 The tomatoes were fresh, the Bocconcini mild with a beautiful soft texture and the asparagus lightly griddled and yummy. 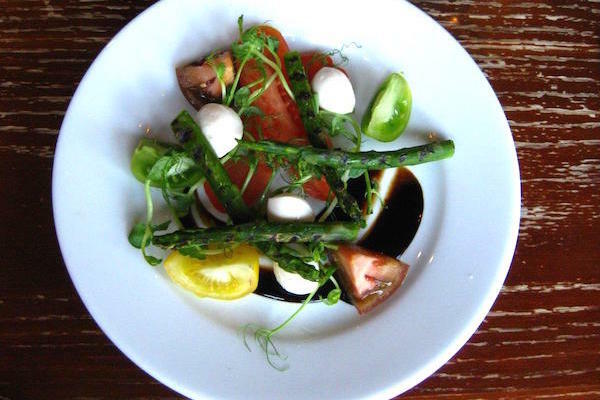 The balsamic glaze brought the whole dish together and was thick, glossy and sweet with the merest hint of vinegary sharpness. 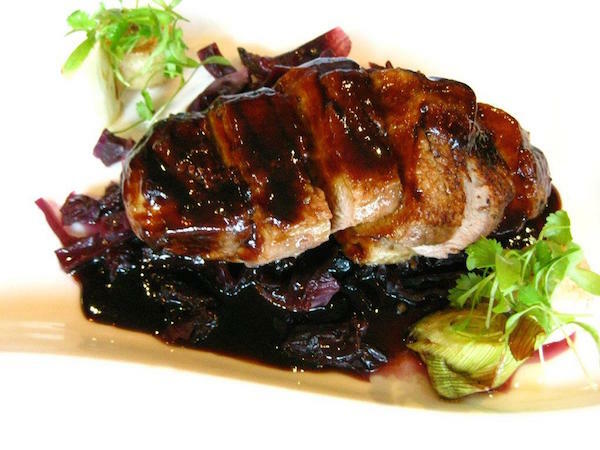 For his main Andrew had the Crispy Skinned Duck Breast with Braised Red Cabbage, Baby Turnip, Leeks and Red Currant Jus. It was rich and meaty with a sticky, sweet, tangy glaze. The sharpness of the juicy, crunchy red cabbage cut though the sweetness to create a well balanced dish. The baby turnips were plump and crunchy and the leek was fresh and tasty. The duck breast itself was well done so if you prefer your duck pink then it might be worth mentioning it when you place your order. 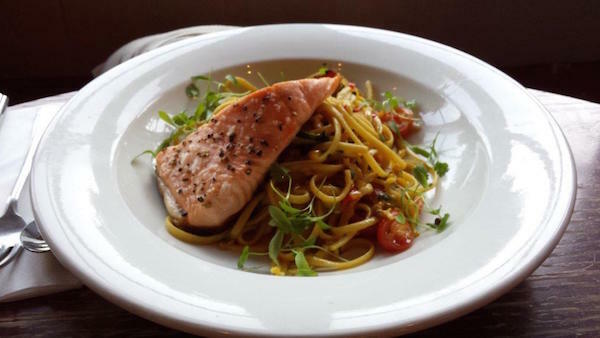 For my main I had the Seafood Linguine with Mussels, Clams and Crispy Skinned Salmon, served with a Saffron, Garlic and Chilli Oil and Spring Herbs. The heady aroma hit me first and set my mouth watering. The salmon was delicious, it was perfectly seasoned and well-cooked with fantastically crispy skin. The linguine had retained a bit of bite and the garlicky oil with a hint of chilli was lovely. The juicy cherry tomatoes and aromatic fresh herbs completed the dish beautifully. We left feeling pleasantly full without feeling heavy and bloated, just the ticket for a hot summer’s evening.